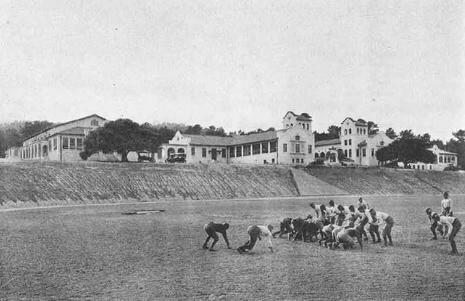 Monterey High School was founded in 1905. 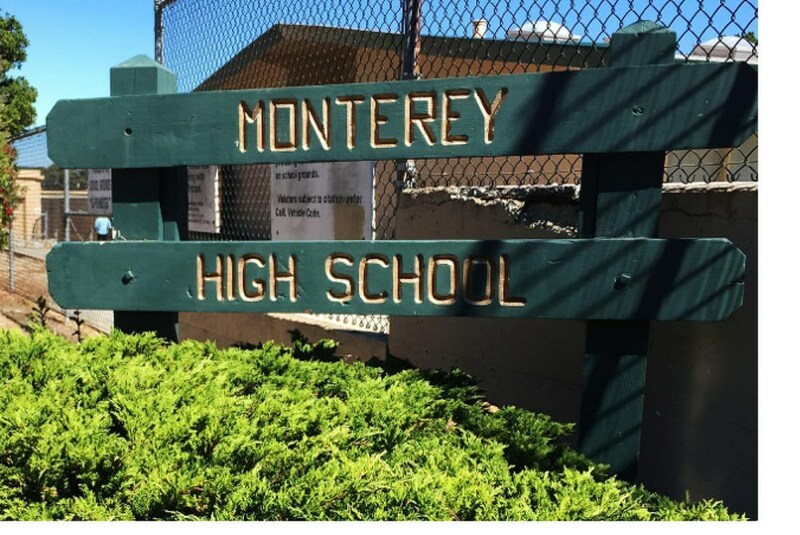 The original Monterey High School (prior to 1905) consisted of two schools; Monterey High School and Del Monte Technical School. 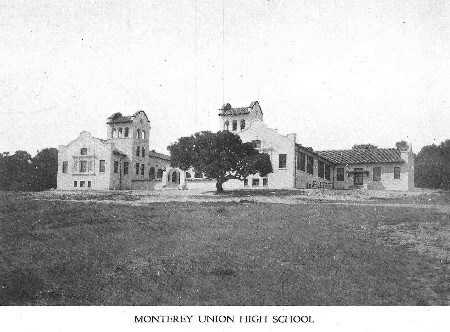 In 1905, the schools were joined to form the Monterey Union High School. The school serviced students from as far north as Castroville to as far south as Big Sur and all of Carmel Valley. The other two Districts, Pacific Grove and Carmel, only serviced student within their city limits, which was very small. The original site stood where the District Office is now. When the original wooden three story building burned down, the new school was built on the current site by 1915. 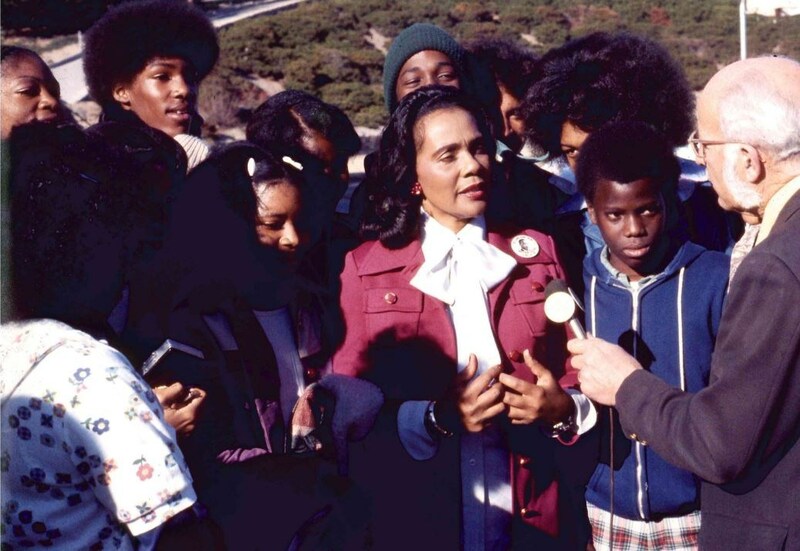 Because the school was surrounded by ravines and forest, the only way students could get into the school site was across the Larkin Street Bridge. The Larkin Street bridge was built exclusively to service the school, so they built the bridge before they built the school. The bridge was an engineering marvel of its time. The design is a suspension bridge, much like the Gold Gate bridge except encased in concrete. It remains one of the only bridges left in the country of this design. The Whisper was the original name of the yearbook, which was not a traditional yearbook, but a collection of student poems and pictures. The word whisper was used to reflect the "whisper" of the student voices in their poems. Keeping with the Spanish tradition, the Whisper was changed to El Susurro. The Monterey Toreador was created after the influences of the region; for example, the Carmel Padres were named after the Carmel Mission, the Pacific Grove Breakers after the coastal waves, Salinas High School Cowboys after cowboys that worked the ranches of the Salinas Valley, and the Watsonville Wildcats after the wild mountain lions of the Santa Cruz Mountains. With the rich Spanish heritage in the City of Monterey, the Toreador was chosen when the school opened in 1905. The original Mascot "Tony the Toreador" caricature, served as the face of the school for 80 years. The toreador mascot painted on the Randall Gym was designed by an art student in 1990s. The Varsity teams were called the Toreadores, the Junior Varsity, the Matadores, the Sophomore teams or Lightweight teams of the earlier years, the Picadores, and of course the Principal, the Clown...well, that label was really only used once and it was reserved for the principal serving between 2000-2007. Contrary to popular belief, the singular Toreador doesn't really exist in the bullring, only "Toreadores" which consist of the matador, picador, and the clown, who diverts the bull away from the matador when he runs into trouble. The school colors Green and Gold came from the "golden hills of Mount Toro and the kelly green leaves of the coastal oaks" based on a student poem written for the 1906 yearbook. Others believe the school colors came from the original Matador's uniform that was Kelly Green and Gold, but according to 1974 Graduate Daniel Albert Jr., it is "your choice of what to believe." There were two fight songs in the history of Monterey High School. The current one, "Toreadores who wear the green and gold...." was created in 1948 and the music taken from Bizet's famous opera, Carmen, but the words were written by a student. Monterey County High School was founded at the original site. The Toreador was chosen as the mascot. The Green and Gold were chosen as the school colors. Three new departments were added, Home Economics, Manual Training and Biology. 8 Seniors were in the graduating class. In 1933, the number increased to 133. The new high school building was officially opened in it's current location. The Cadet Company was formed. The Auto Repair, Marine and Gas Engine Shop were built. The stone bleachers were built. The current school fight song was written.